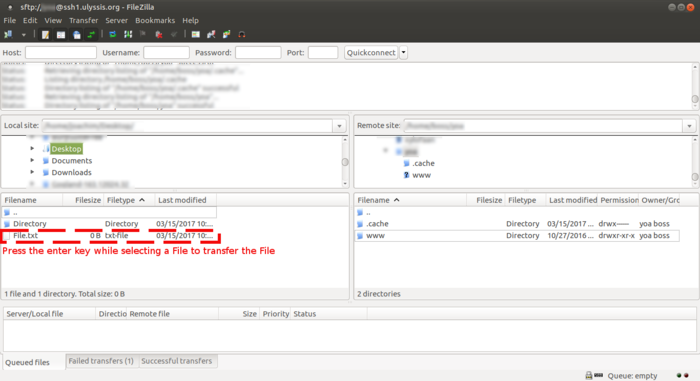 Next to running commands, you can also use the shell servers to access your files. There are several methods to do this, some graphical, some not. The former definitely are the easiest option to go for. On the server, your files are located in /home/group/username/. For a normal user with username username/ this will be /home/user/username/, for an organisation with username organisation/ this will be /home/org/organisation/ etc. 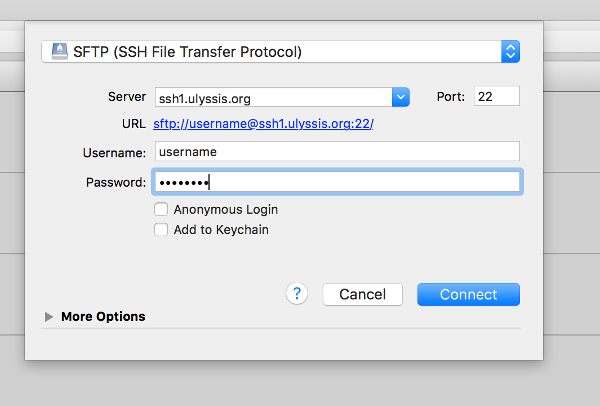 If you are connecting for the first time, you will need to accept the identity of the server. Enter your username and password and connect, if necessary, unlock your keyring by entering your computer's password. This will open up a file browser connected to the remote server. Here, you can create new files, delete files, upload files (by copying or dragging them in the file browser), download files (by copying or dragging them from the file browser), change file rights etc. 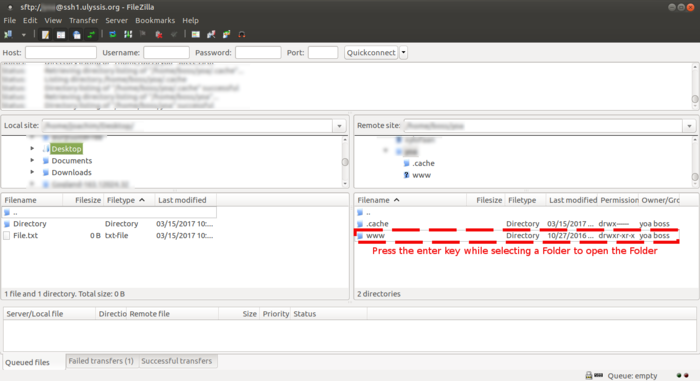 If your distribution does not contain an option to connect to a server, you can use FileZilla, which is completely free. See the instructions under Windows. Windows doesn't support native remote file browsers, so you will have to download a program first. A good option is FileZilla, which is completely free. Download it, install it and run it. FileZilla, which was mentioned above, is also available for Mac. To use it, follow the instructions for Windows. You can also opt for Cyberduck, though. In that case, follow the instructions below. Follow the installations instructions and afterwards open Cyberduck in your Applications folder. Click on 'Open Connection' in the left top corner. Click on 'Connect' and you're done. By dragging and dropping you can manipulate files from and to your Mac. If you want to connect again later on, you can just click the Bookmarks icon on the top left. Next you click on History. And then you can double click to re-open the connection. 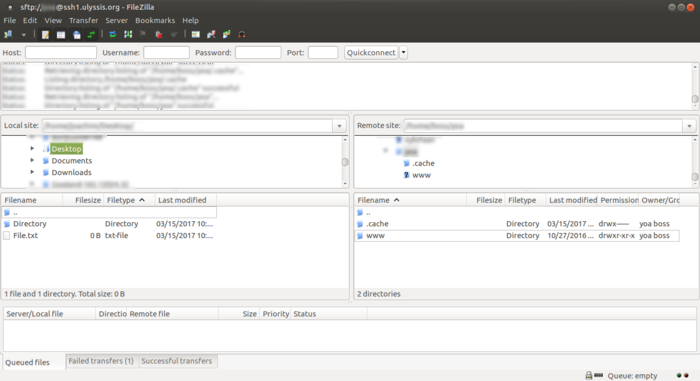 As you can see, the local files are located on the left-hand side, while the remote (server) files are located on the right-hand side. 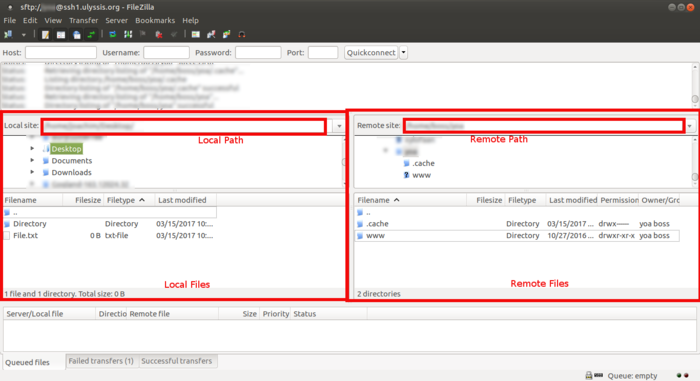 File navigation and paths are also present. 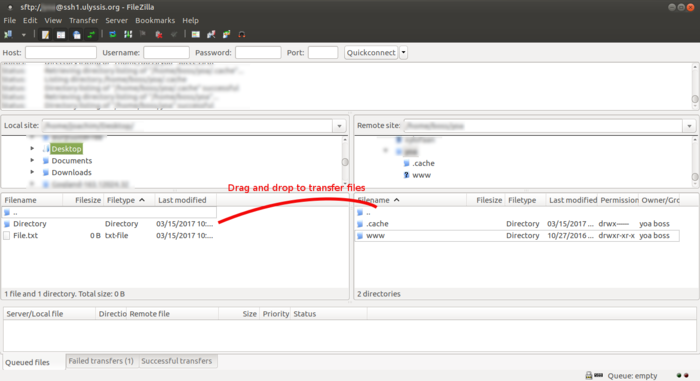 To transfer a file or folder, you can drag and drop it, either from the local side to the remote side, or from the remote side to the local side. These operations represent uploading and downloading respectively. You can also press enter while selecting a file, or double-click a file, to transfer it. To open a folder, you can double-click it, or press enter while selecting it. You can delete files or folders by pressing the delete button while selecting them, or by right-clicking and clicking 'delete'. 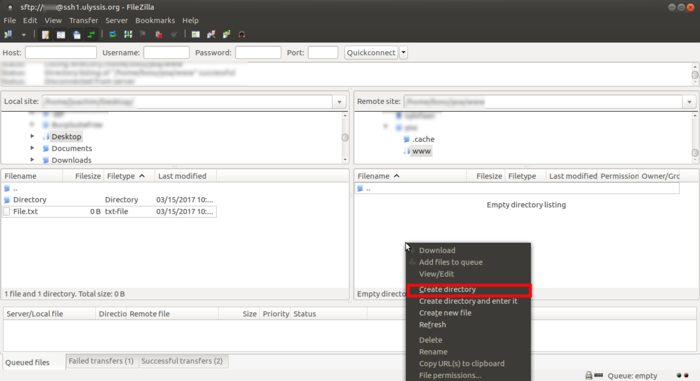 To create files or folders remotely, you can right-click the remote window and click 'create directory' or 'create new file'. As you can see, the menu has some more interesting options, for example 'rename' or 'view/edit'. For other examples and more info, see http://www.hypexr.org/linux_scp_help.php.